Ok, a personal twists challenge is ON like DONKEY KONG. I've OFFICIALLY challenged myself to rock the mess outta twists the rest of this winter. So far, they are doing right by me. I don't have to do anything to my hair in the morning except mist, fluff and go and no dry and greasy hair has been in this house since I added them back to my (winter) regimen. Right now, I'm all about leavin my hair alone for the rest of the winter. Sounds like I'm back on the Crown & Glory Method tip, right? Betcha bottom dollar, I am. My hair has spoken and I've listened. I'll be twisting with my shea pudding and moisturizing daily with a different mist recipe: water, aloe vera gel/juice, and castor oil. I've chosen castor oil over my usual jojoba oil b/c it's thicker and I feel that will help me retain even more moisture since the air right now is so cold and dry. Blogger shrink the pics so much! Click on the pic to see a larger view. So who's with me? I hope some of you will join me (lemme know!). I think we'll be pleasantly surprised come April with what our hair is lookin like. I will provide updates monthly. I have to give this challenge a shot! Your hair is really growing. Mine doesn't seem to be doing much of anything these days. I might just do the same... I've been looking for a way to lengthen my tresses, because I really only have like four styles that I can do with my short naps. Afros really don't look good yet because my lil girls are too short!! twists are my staple and I do enjoy them. good luck with your personal challenge! I'll be unofficially joining you- I have one week this month that I won't be in twists since I'll be on vacay in a warm place and want to rock another style...but other than that-I'll be twisted up. my reggie is similiar to yours. I try to keep them in for 2 weeks at a time and I moisturize as necessary. 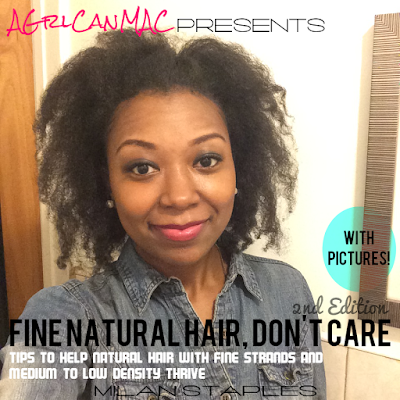 I usually 'rinse' in between the 2 week frame with diluted conditioner and water. I'll be adding castor oil mix with sweet almond oil to my scalp starting this month (as soon as the package arrives)!!! While I'm in braids at the moment.. I can't wait to switch back to that way of wearing my hair.. it works wonder!!! Yay I have some takers! Let's do it ladies. It really is going to be a challenge bc I just got finished looking at some pics of Shingai Shoniwa's (from The Noisettes) hair and OMG I want my hair loose so I can try some of her hairstyles! Lol. Man, come April, I'm ON some of her hairstyles. Im in a braids/weave combo at the moment. Im trying to make it until at least the end of February. 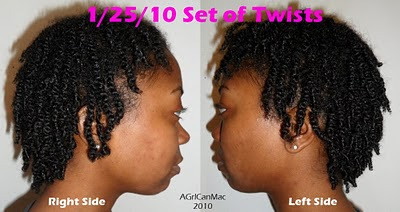 Once I come out I have the same routine in mind, 2 week twists, once a month henna!!! Hey Ouidad, thanks for letting me know. I'll def follow you on Twitter. Lex, try tying a satin scarf around your head at night and then putting a satin bonnet on over top. That always kept my twists from sticking up when I experienced that problem. Then if they're a lil flat in the morning, just spritz them with some of your favorite moisturizing mist and they'll plump back up. Hope that helped! Shawnystheone, great minds think alike! Join us when the braids/weave combo comes out. I see your challenge and I accept! Just twisted my hair up last night. Much to my man's dismay I had a significant hair cut last week; to achieve shape and get rid of split ends. Then twisted it on the weekend. I promised him that I would look after it as best as possible to achieve maximum length, this scottish snow is a brutal contender - so I'm in!